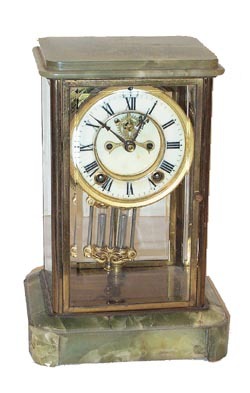 Ansonia Clock Co. crystal regulator, "Dutchess", ca 1914, with a mottled green onyx top and base. The onyx, being veined as it is, always has hairlines. That is the nature of onyx, but it is all there, and tight. The brass case, with 4 perfect beveled glasses, is in between the onyx top and base. When new, the book would have called the brass case, "polished brass". It is now dull and needs to be cleaned and polished. Case stands 11 inches high. The 8 day movement, with rack and snail count, strikes a standing gong, on the half hours; it is running and striking very well. The 2 piece porcelain dial has one small hairline, almost too insignificant to mention. Open escapement, correct hands, a more elaborate pendulum than you usually find with this modelclock. Ly-Ansonia No. 392.